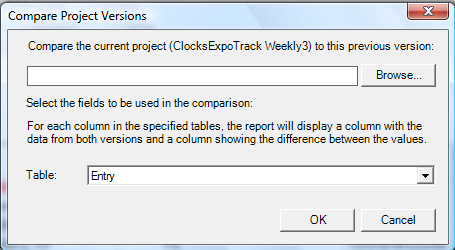 In many cases you will have more than one Microsoft® Project file (mpp) for the same project; usually this is called versioning. After some time you will want to know what are the differences between two versions of your project. This situation is likely to appear when dealing with large projects stretched over long periods of time, which involves several teams working together on the same shared project. This involves several reporting activities that take place as a recurrent task, when each team member has to periodically update the progress on his assigned tasks. This yields the need for the Project Manager to have a quickly and convenient way of spotting the differences between the current project plan after updates were inserted and a previous version of the same file. 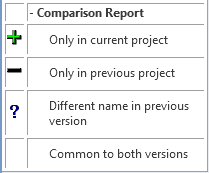 Compare Projects utility helps compare two versions of a project: you can review differences between the current version and an earlier or later version of the same project in a detailed report. You can also use this tool to review a current version of a project and one or more projected versions of the same project reflecting different possible scenarios. This may prove useful when evaluating different possible outcomes and potential shortcomings to arise in the future based on the current status. On the Reports menu click Compare . To locate project versions, click Browse. You can only compare project versions for which you have access permissions. In the Task Table lists, click the table that contain the data that you want to compare.